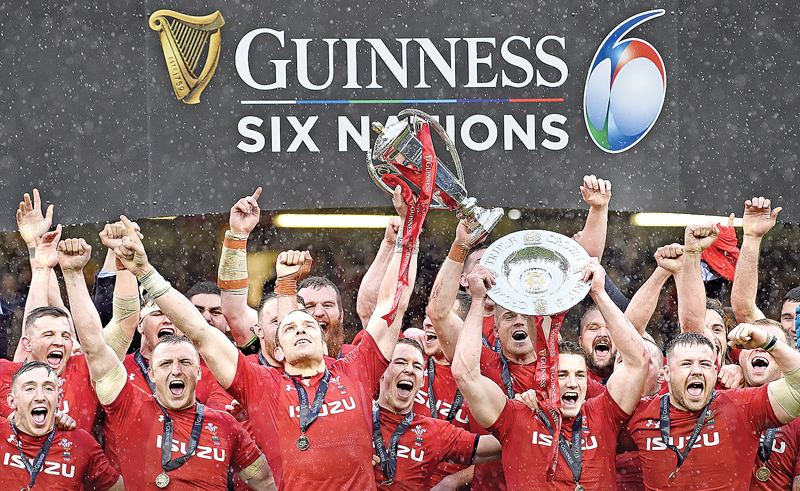 CARDIFF, Saturday - A ruthless Wales fired out a raking World Cup warning shot after gutting a misfiring Ireland 25-7 to win the Six Nations Grand Slam on Saturday. A blistering start saw Hadleigh Parkes gather a Gareth Anscombe chip for the opening try before most people in the Principality Stadium had taken their seats. Anscombe converted and went on to kick six penalties, Ireland scoring a late converted try. The victory was Wales’ 14th straight win, captain Alun Wyn Jones admitting that they were now a target going into this year’s Rugby World Cup in Japan where they have been drawn in Pool D along with Australia, Fiji, Georgia and Uruguay. “We’ve put a big target on our back for a lot of other teams,” said Jones, having won a joint Welsh record 134 Test cap, nine of those having come for the British and Irish Lions. Jones added: “This group hasn’t just popped up, it’s been developed and if we do drop a game, it’s not a case of panic stations, it’s a case of going again. “We’re put through our paces to perform. I’ve played in games we’ve lost games because of lack of game management. It’s nice to see that we’re managing games better. 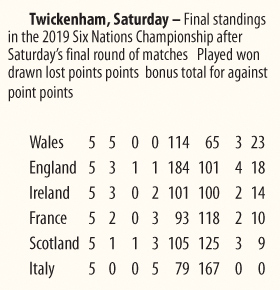 In the last two World Cups, the teams who have won the Six Nations championships (Ireland in 2015 and England in 2011) have floundered. But Wales coach Warren Gatland, who will step down after the World Cup, was not unduly worried by the pressure of having also moved up to second in World Rugby rankings. “I don’t think it makes any difference to us,” the New Zealander said. “We’ve just kept our heads down while we work hard. This group of players will run through a brick wall for you. Turning to the World Cup, Gatland added: “We’re in a pool that if you can win you potentially don’t face solid southern hemisphere teams on the way through. “I’m excited about the World Cup because you get that two or three months together as a side and you can prepare like a club side, you can go into skill work and skill development and really fine-tune your game. “From that point of view we’ll be in great shape. The two previous World Cups that I was involved in we were one of or the fittest teams in the World Cup. “We’ll be in pretty good shape for this one as well,” he warned. Ireland coach Joe Schmidt was left bemoaning his side’s ill-discipline and a disappointing set-piece, but pleaded with Irish fans to stay loyal ahead of the World Cup. “We’d like to encourage the genuine supporter not to lose faith with the team, that the team will definitely turn up in Japan,” said Schmidt, like Gatland a Kiwi who will also step down after World Rugby’s showcase tournament that runs from September 20-November 2.